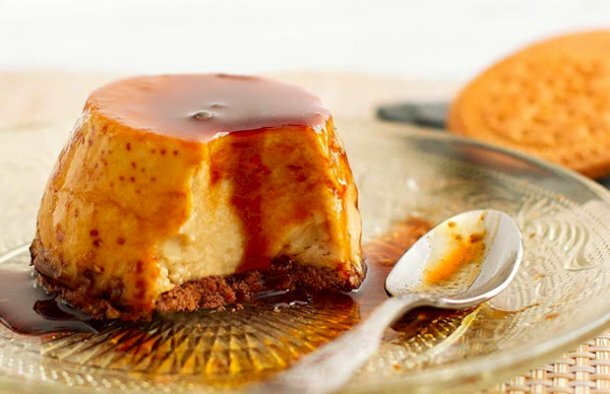 This delicious Portuguese flan with Maria biscuits (flan caseiro de bolacha maría) will take a while to make, but it will be worth it. Fill a baking pan half way with water and place it in the oven. Next, pour the caramel in the pudding pan and move it around a little so that it covers the sides of the pan. In a bowl, place the eggs and beat lightly, without making too much foam, add the sugar and mix until blended well with the eggs. Add the milk and the condensed milk and mix. Finally add the crushed maria biscuits and vanilla, beat until everything is well mixed and pour into the pan. Place the pudding pan inside the baking pan with water in the oven and bake in a water bath for about 25 minutes. After 25 minutes, test the toothpick, if it comes out slightly moistened, it is ready. Let it cool and refrigerate for about 5 to 6 hours. Meanwhile, in a bowl mix a little nutela (warm it up just a little in the microwave to mix better) with some chopped maria biscuits. 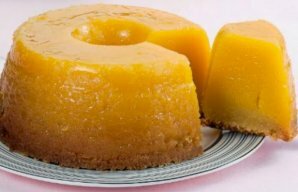 Spread a layer on the surface of the pudding and place it back in the refrigerator. Note: The original recipe asks to make individual sized puddings, this recipe above is for one regular sized pudding. How to make Portuguese golden slices. 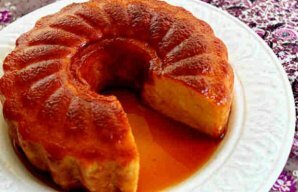 This Portuguese caramel bread pudding recipe is easy to make and just uses a few simple ingredients.